analysed the search results for millions of keywords throughout 2014 to rank the top ten websites displayed in the two Google ad formats. The rankings were drawn up according to a PLA Visibility score and a PPC Visibility score which are a measure of how frequently and prominently the sites’ ads appear within search results. 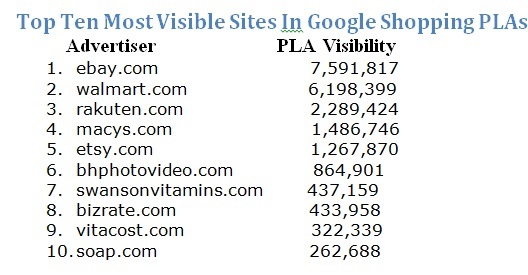 In the list of top sites displayed through AdWords, Amazon.com’s PPC visibility score of 9,381,597 made it the clear leader. The list was made up of a mix of retail brands and search engines such as wow.com and ask.com . PLAs, which include a product image, name and price together along with a link to the reseller, became the default way for appearing in Google Shopping in 2013. 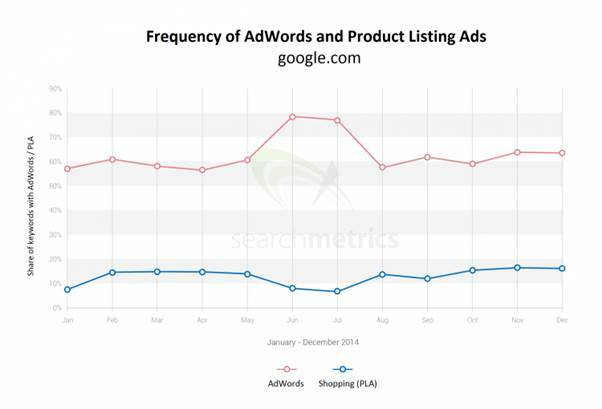 A Searchmetrics study released earlier this yearindicates that PLAs have experienced rapid adoption, with the number of ads displayed growing by +118% during 2014 alone. AdWords ads, which have been around for many years, are very widely used and are not growing as rapidly as the relatively new PLA. The findings of Searchmetrics’ study are presented in a whitepaper, “Google Shopping & AdWords: The 10 Most Important Players” which can be downloaded here.